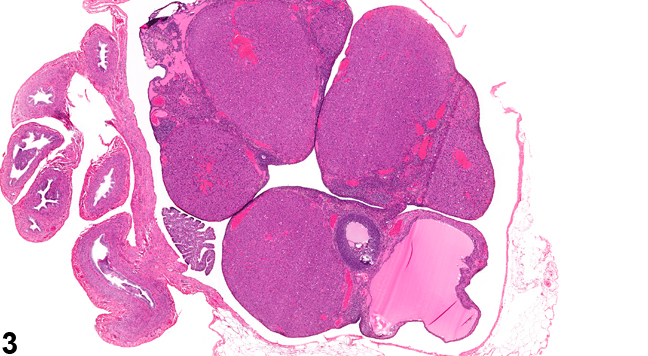 Ovary, Corpus luteum - Cyst in a female F344/N rat from a subchronic study. 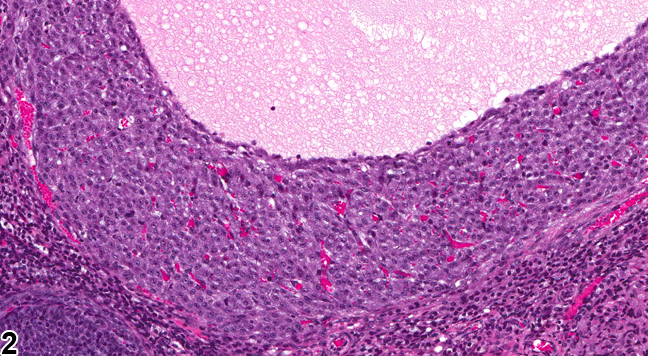 The cyst is thick walled and fluid filled, and a secondary follicle lined by dark basophilic granulosa cells is present in the adjacent parenchyma. 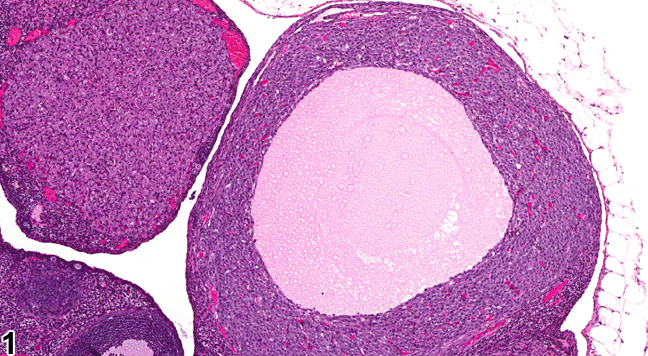 Ovary, Corpus luteum - Cyst in a female F344/N rat from a subchronic study (higher magnification of Figure 1). The cyst wall is composed of several layers of luteinized granulosa cells containing foamy, vacuolated, eosinophilic cytoplasm, and the lumen contains acellular eosinophilic material. Ovary, Corpus luteum - Cyst in a female F344/N rat from a chronic study. The cyst is at the periphery of the ovary. 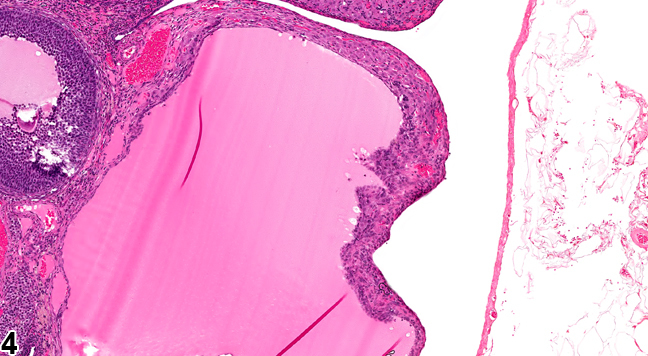 Ovary, Corpus luteum - Cyst in a female F344/N rat from a chronic study (higher magnification of Figure 3). There is eosinophilic fluid within the cyst. Cysts of the corpora lutea ( Figure 1 , Figure 2 , Figure 3 and Figure 4 ) are larger than a normal corpus luteum and may distort the ovarian architecture. They are lined completely by several layers of polygonal cells, with abundant eosinophilic, finely vacuolated luteal cells. Cyst formation occurs in a true corpus luteum, so there is no evidence of degenerate ova within the cystic cavity. Cystic corpora lutea are derived from ovulatory follicles. If functional, these cysts may result in prolonged, noncyclic progesterone stimulation. Luteal cysts must be differentiated from corpora lutea that did not fill in normally but that progress through the estrous cycle. Progesterone receptor inhibitors induce typical luteal cysts in rats. Ovarian luteal cysts should be diagnosed, but cysts occurring as background lesions need not be graded. In the case of a luteal cyst, the diagnosis should include the type of cyst/location as a modifier (i.e., Ovary, Corpus luteum - Cyst). If the cysts are thought to be treatment related, they may be graded to fully characterize the treatment effect. If applicable, the terms "bilateral" and "multiple" may be included in the diagnosis. Dixon D, Alison R, Bach U, Colman K, Foley GL, Harleman JH, Hawarth R, Herbert R, Heuser A, Long G, Mirsky M, Regan K, Van Esch E, Westwood FR, Vidal J, Yoshida M. 2014. Nonproliferative and proliferative lesions of the rat and mouse female reproductive system (INHAND). J Toxicol Pathol 27(suppl):1S-107S. Greaves P. 2012. Female genital tract. In: Histopathology of Preclinical Toxicity Studies: Interpretation and Relevance in Drug Safety Evaluation, 4th ed. Elsevier, Amsterdam, 667-724. National Toxicology Program. 2011. NTP TR-563. Toxicology and Carcinogenesis Studies of Pulegone (CAS No. 89-82-7) in F344/N Rats and B6C3F1 Mice (Gavage Studies). NTP, Research Triangle Park, NC.